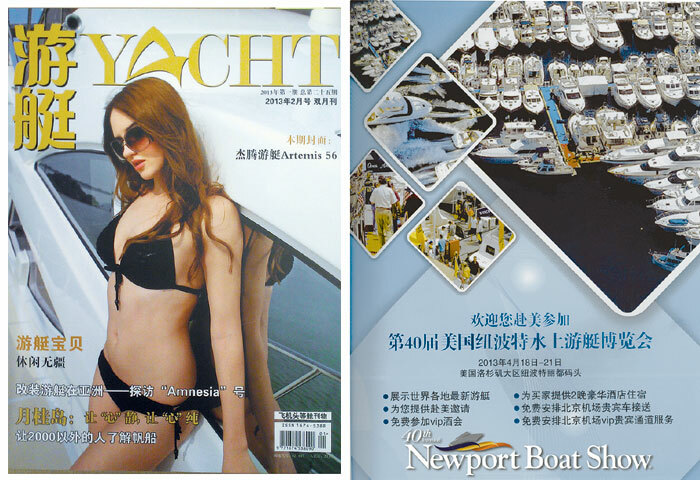 NEWPORT BEACH — The upcoming Newport Boat Show, scheduled April 18-21, is being featured in a full-page color ad this month in a magazine geared to upscale jet-setters in China. In addition, the company that publishes the magazine will organize a VIP travel package, flying a group of high-net-worth clients from China to attend this year’s show. Beijing Sunbelt Media distributes its luxury lifestyle publication in airport VIP lounges for First Class and Business Class passengers in China, and it also organizes elite international travel packages for its upscale clients from Beijing. After a meeting last week with a delegation from Beijing Sunbelt Media at the show producer’s office in Irvine, plans were discussed for a variety of special events in Newport Beach for the 20-40 VIP visitors expected to attend the April boat show from China. The group is expected to arrive in Newport Beach to attend the Newport Boat Show after a stop in Lake Tahoe, via a private jet. Beijing Sunbelt Media was originally put in touch with the Duncan McIntosh Co., producer of the Newport Boat Show (and publisher of The Log Newspaper, Sea Magazine, Boating World and Editor & Publisher), by Visit Newport Beach Inc., which has identified a variety of other local points of interest for the visiting VIPs from Beijing — including Fashion Island. This year, the Newport Boat Show is celebrating its 40th anniversary at Lido Marina Village — with more than 200 new and brokerage power and sail vessels, and the latest boating gear, engines, marine electronics and services. For more information on the show, call (949) 757-5959 or visit newportinwaterboatshow.com.